Finally, The Scarlet Room - Episode 2 is now available! After the surprising feedback from the first episode, we read every single critics and suggestions before developing the sequel. In the first The Scarlet Room game, some elements looked pointless, but, in The Scarlet Room - Episode 2, if you are minimalist, will notice some links. Everything you saw in the first game and will see in this one are pieces of a mysterious and conspiratory history that will be revealed over the games. 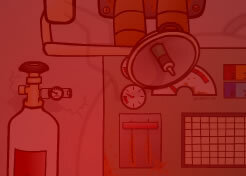 The challenge level of this Point and Click Room Escape game is high and, probably, it will be necessary the use of search engines to solve some puzzles. Think subjectively, sometimes what you are seeing is not the straight answer to the puzzle. If you get stuck in the beginning of the game, don’t give up, this is one of the hardest puzzles in the game. I’ve already seen people who finished The Scarlet Room - Episode 2 in discussion about the history and the ending. Some had pretty interesting theories, some found out part of the tram, but there is a lot to discover. Some didn’t like the ending, but it is more complex than looks and you will notice it in the future. Have fun and, once more, leave your critics and suggestions! Could you escape without reading a walkthrough? ;) Enjoy!